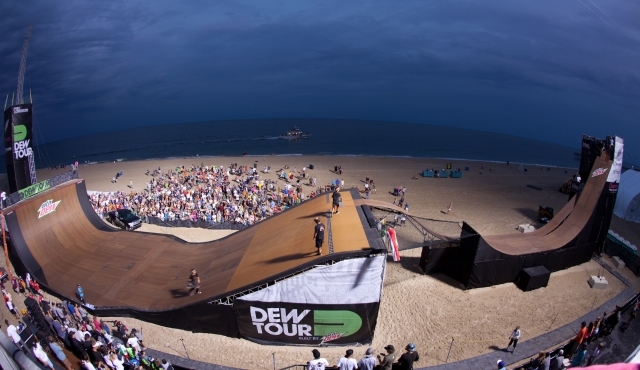 A cool change for the Dew Tour 2012 at Ocean City was the addition of the SKATE MEGA 2.0TM discipline. So the Ocean City event the skate discipline line up looked like this: SKATE VERT, SKATE BOWL, SKATE LEGENDS BOWL and the SKATE MEGA 2.0TM. Also confirmed athletes for this year were as follows for SKATE VERT you have: Pedro Barros, Marcelos Bastos, Sam Beckett, Under Armor's Mitchie Brusco, Bob Burnquist, Sandro Dias, Pierre-Luc Gagnon, Ronaldo Gomes, Juergen Horrwarth, Positiv Skateboard's Andy Macdonald, Danny Mayer, Alex Perelson, Paul-Luc Ronchetti, Tom Schaar, Jono Schwan, Elliott Sloan, Adam Taylor, Lincoln Ueda and everyone's favorite big air Baltimorian Green Issue's Bucky Lasek. 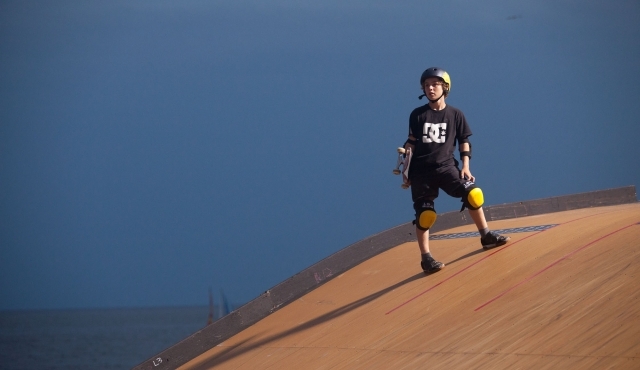 After the dust settled, 12 year old skateboarder Tom Schaar launched a lien 180 over the gap and spun a 1080 on his way to winning the Mega 2.0 Big Air contest and taking home the Dew Cup on Sunday at the 2012 Dew Tour Pantech Beach Championships in Ocean City, Md. He is the only skater to have landed the trick in competition. "I think it is a little bit easier to throw [1080s] on Mega 2.0 because it is easier to grab your board," Schaar said after the competition, which took place late in the evening after rain delays that canceled the Skate Bowl super finals earlier in the day. The new Mini MegaRamps are designed to allow safer progression in Big Air skateboarding, and training facilities at the Camp Woodward action sports complexes have given rise to a younger generation of Big Air competitors. Tom Schaar beat out Elliot Sloan, who landed a 720 tail grab over the gap and a 540 tail grab on the quarter-pipe, and big air pioneer Bob Burnquist, who hucked a backflip over the gap and a 720 on the quarter-pipe. "It was insane that Elliot put down a tail grab 720, which I don't think anyone has ever done before on Mega 2.0," Schaar said. "It was so gnar. Then Bob did a backflip over the gap to a 720. It was insane!" Mitchie Brusco finished just off the podium in fourth place with a tail grab 540 over the gap and a 540 varial on the quarter-pipe.